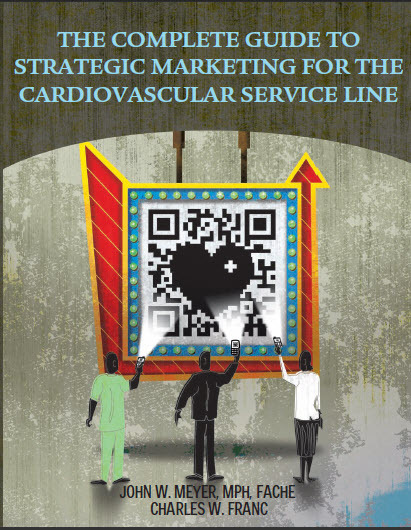 With all that is going on in healthcare today, and the cardiovascular services environment in particular, why has CFA written a book on strategic marketing for the cardiovascular (CV) service line? Because of our deep interest in and concern for the future of the cardiovascular enterprise and our collective feelings about how a sound marketing orientation and perspective is both undervalued and frequently underdeveloped in today’s hospitals. Understanding the essence of marketing concepts, their specific application to CV service line development and planning and their fundamental role in the day-to-day management of the service line is critical to developing a high-performance enterprise, to earning buy-in from key constituencies and a return on your marketing investment. The overall premise of the book is that marketing, though not the institutional force it was when first widely introduced to hospitals in the 1980’s, still has much to offer the CV Service Line Administrator (SLA). Marketing philosophy, principles and practices have real value, particularly now, because of the evolving and challenging healthcare environment. Today’s healthcare trends and keys to success are largely driven by forces external to the hospital. The strategic marketing process focuses on these external forces. Hospital administrative personnel, whether formal service line administrators or others responsible for cardiovascular programs and services can and should be fully capable of understanding marketing philosophy, principles and practices and implementing them in their everyday pursuit of enhanced service line performance. The six major success trends outlined in the book support the premise that enhanced marketing capabilities at the service line level will strengthen and increase performance. Marketing’s role can be leveraged in the strategic management of the service line. Marketing tools, such as the marketing audit, positioning, brand management, market plan development and results monitoring, can produce tangible results. The effective use of social media can successfully position the CV service line for growth. An effective marketing self-assessment is an excellent way of evaluating the reader’s readiness and ability to implement a marketing philosophy. The book is designed to augment philosophy, principles and practices with practical tools, straightforward ideas, real-world examples and case studies from CFA’s collective consulting experience in hundreds of hospital cardiovascular programs throughout the United States. The book can be ordered online at www.healthleadersmedia.com, or by calling (800) 753-0131. As always, CFA invites your comments, suggestions and questions. Already read the book? Please leave a comment. We would welcome your feedback.